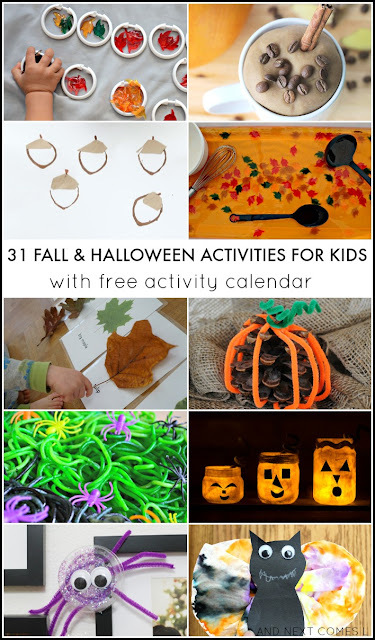 Free fall and Halloween activity calendar for kids. Keep the kids busy all October long with these awesome activities and crafts for kids! Do you find it challenging to find activities and crafts to keep your kids busy every single day? Do you wish you could just have an organized list of activities and crafts to keep your kids busy for an entire month? I know I do (yes, even kid bloggers get into ruts)! 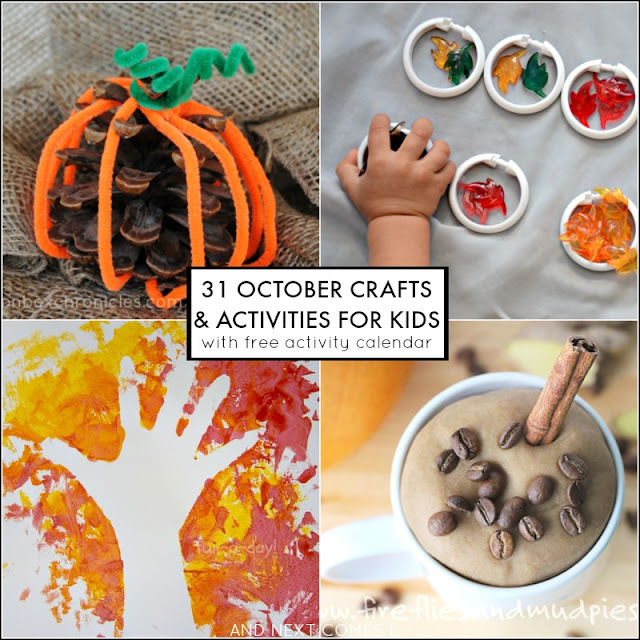 Well, here are 31 fall and Halloween inspired activities and crafts for kids that will get you inspired and playing every day in the month of October. I've even included a free activity calendar. That means I've done all the hard work for you. All you need to do is check out the daily activity, set it up, and play with your kids. No need to plan or pin a billion more things on Pinterest, just download this activity calendar and you're good to go! As I mentioned, I've put together a wonderful list of 31 fall and Halloween activities and crafts for you. That's one activity per day for the entire month of October. Here are the activities that you will find on the free activity calendar for October. 5. Negative Space Fall Handprint Tree Craft from Fun-A-Day! 12. Simple Bat Craft from Fun-A-Day! These 31 fall and Halloween crafts and activities can be found on this free activity calendar for kids. Download your copy below and keep it handy on your phone or computer. Then every morning, simply open the calendar, find the current date, and click on the corresponding photo. You will be taken to the activity's or craft's instructions. No need to plan activities for your kids as this calendar has it all: math, science, crafts, fine motor activities, and more! To download the calendar, either click on the image below or click the link below the image. Love the calendar idea! And how you made it with pictures!